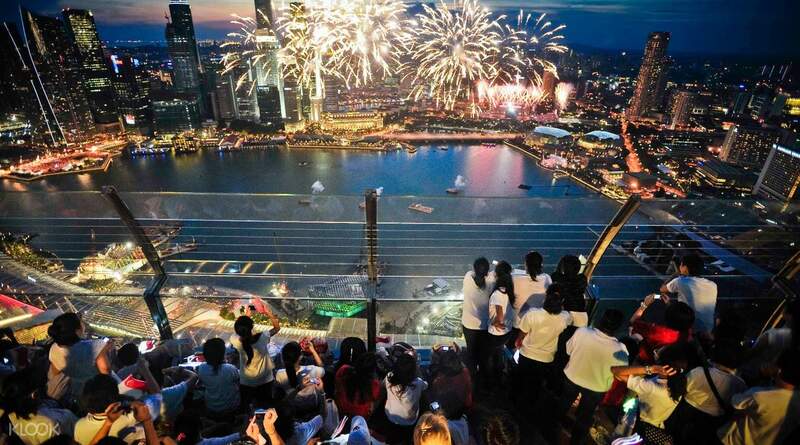 Catch the Spectra Light and Water Show once you get down at 8:00pm and 9:30pm or watch it from the Skypark! 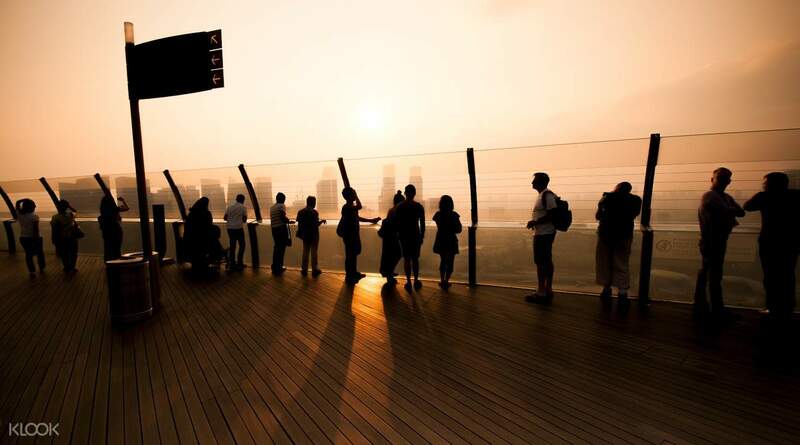 Perched on top of the iconic Marina Bay Sands towers, 57 levels above ground, a visit to the Skypark's Observation Deck is a must for anyone looking to get the best view of the city's gorgeous skyline. Enjoy hassle-free access to this popular landmark by booking through the Klook website/app - simply purchase your ticket at least one day prior to your preferred visit date, show your voucher at the entrance, and you're good to go! 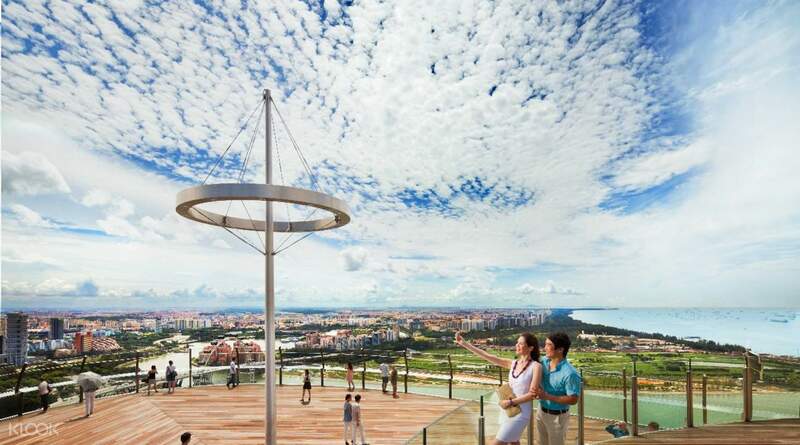 Drink in uninterrupted views of the busy city while you're 200 meters above the ground, where your eyes will be treated to some the city's best sights, including tourist attractions like Gardens by the Bay and Supertree Grove, stretching all the way out to Singapore Strait. Take unbeatable souvenir shots to commemorate your visit to Singapore at the top of the Marina Bay Sands' trio of towers, which are sure to impress your family and friends back home! Prepare to be amazed as you watch the sun setting at dusk, painting the clear skies with bright splashes of colors, then stare at the twinkling lights coming from the skyscrapers surrounding you. After capturing multiple pictures from the Skypark, come on down to the 1st floor Event Plaza to enjoy the Spectra Light and Water Show which happens every 8:00pm and 9:00pm daily with an additional 10:00pm show on Fridays and Saturdays. Remember to catch the Spectra Light and Water Show, which runs at least twice every night! Saved so much time by buying tickets while waiting in the queue. There was a even crazier queue with people waiting in the queue to go to the bar. Just walking through the shopping centre to get the there is amazing. You cannot get to the infinity pool unless you are staying in the room. Now the view. Obviously it is amazing. we waited around until 8pm to see the laser light show below. We also went down to watch the show again at 9pm. Much better up close. also by the way it took 30min waiting in a queue to leave. Saved so much time by buying tickets while waiting in the queue. There was a even crazier queue with people waiting in the queue to go to the bar. Just walking through the shopping centre to get the there is amazing. You cannot get to the infinity pool unless you are staying in the room. Now the view. Obviously it is amazing. we waited around until 8pm to see the laser light show below. We also went down to watch the show again at 9pm. Much better up close. also by the way it took 30min waiting in a queue to leave. The process was so smooth. All I had to do is just look for the admission where the city easily led me to it. I was there on time per my itinerary. I was able to close off my birthday with a sunset viewing from this amazing deck. I love Singapore in general so this is such an enjoyable experience for me. Again, this is 100% legit. The process was so smooth. All I had to do is just look for the admission where the city easily led me to it. I was there on time per my itinerary. I was able to close off my birthday with a sunset viewing from this amazing deck. I love Singapore in general so this is such an enjoyable experience for me. Again, this is 100% legit. This is an observation deck up on the 56th floor of the marina bay sands hotel. You can access the venue form the hotel lobby and get the chance the see the famous hotel- so that’s 2 sceneries ticked:) the deck is quite small with 360 view of the coastline and the city view. The view is picturesque. This is an observation deck up on the 56th floor of the marina bay sands hotel. You can access the venue form the hotel lobby and get the chance the see the famous hotel- so that’s 2 sceneries ticked:) the deck is quite small with 360 view of the coastline and the city view. The view is picturesque. this was so worth itm we were already tired and was thinking of skipping this one specially when we saw the line leading up to the observation deck. but decided to go through it as we were already there. and glad we did! 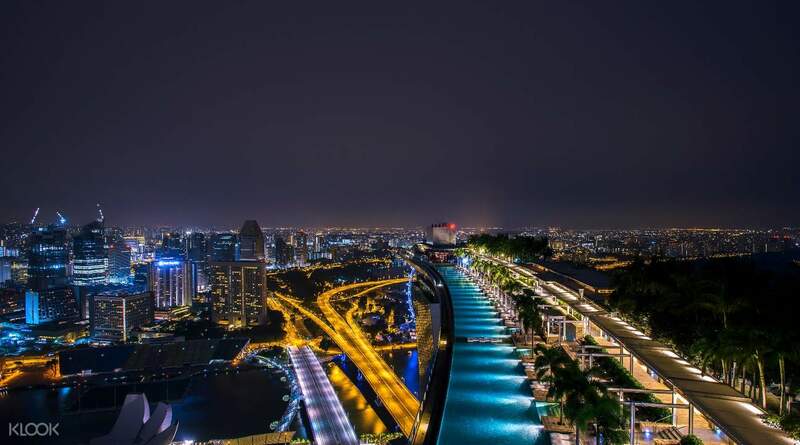 singapore skyline is amazing with all the lights and the views. this was so worth itm we were already tired and was thinking of skipping this one specially when we saw the line leading up to the observation deck. but decided to go through it as we were already there. and glad we did! singapore skyline is amazing with all the lights and the views. No queue with klook voucher. It is your entry ticket. Easy to reach from the MRT. Information on klook website about closeout hours is very useful. Please check it before visit the observation deck. And ofcourse, the discounted rates on klook are the best. No queue with klook voucher. It is your entry ticket. Easy to reach from the MRT. Information on klook website about closeout hours is very useful. Please check it before visit the observation deck. And ofcourse, the discounted rates on klook are the best. Its great to skip the queue to purchase ticket at ticketing counter. Show the voucher on phone and they would scan when going up. Quick and Easy. Great view up there and cold too as its very windy. During CNY, fireworks show available at 10pm. There is a restaurant at the deck. Big area at the deck, could just sit anywhere on the floor to enjoy the great view of Singapore city. Its great to skip the queue to purchase ticket at ticketing counter. Show the voucher on phone and they would scan when going up. Quick and Easy. Great view up there and cold too as its very windy. During CNY, fireworks show available at 10pm. There is a restaurant at the deck. 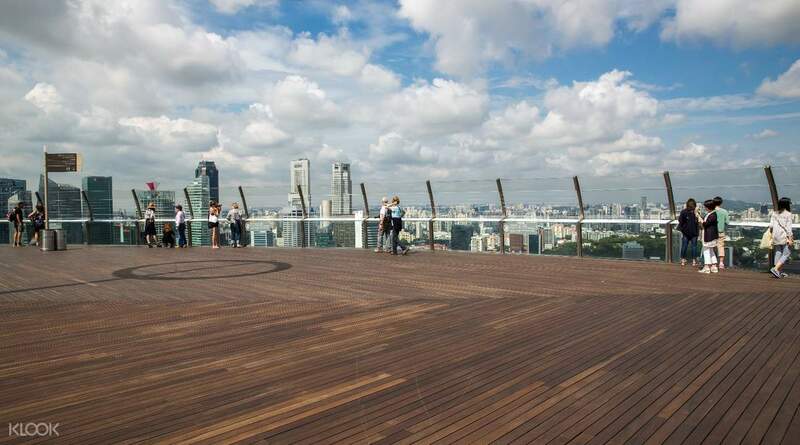 Big area at the deck, could just sit anywhere on the floor to enjoy the great view of Singapore city. Was a bit lost at first but thanks to some good people for their help and we found our way. Also the entry was easy. Just show it to the entrance and they wil just scan the code and you’re off to go. It was night time when we got there but the view was still stunning. It was kinda windy though. We were also able to watch the light show also in front of Marina Bay. Thanks Klook! Was a bit lost at first but thanks to some good people for their help and we found our way. Also the entry was easy. Just show it to the entrance and they wil just scan the code and you’re off to go. It was night time when we got there but the view was still stunning. It was kinda windy though. We were also able to watch the light show also in front of Marina Bay. Thanks Klook!